Weirdly, despite less than impressive sales figures, Spectacle's might be Snap's most consistently reliable venture. It's having little to no effect on their credibility or IPO, it's not being ripped off by another other major tech companies and they're not competing with anyone else to promote it. That last one is particularly important, because it means that they don't have to keep up with trends, it's their playground. That's why they've done things like, say, using giant yellow vending machines to distribute them, and now they've broken out a very interesting new PR stunt - they've sent the Spectacles below the waves. 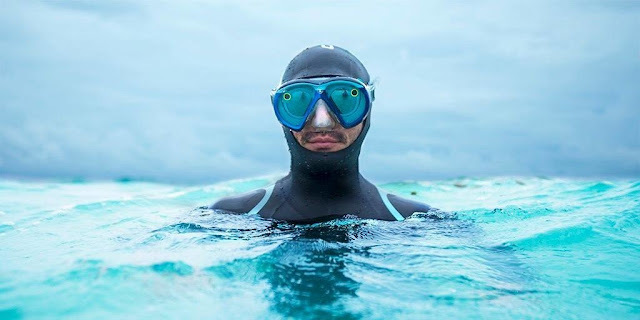 Teaming up with Royal Caribbean, they've developed a kind of specs/diving mask hybrid, effective for 30 minutes and capable of working in depths up to 150 feet. To demonstrate, three divers took the 'SeaSeekers' for a test drive. The first, marine biologist Gabriela Nava, used them to demonstrate what coral planting looks like. The second, wildlife photographer Roberto Ochoa, used them to search for migrating whale sharks, and although he didn't manage to find any, he caught a lot of other interesting marine fauna in the process. They saved the best for last though. On Sunday, they released footage of free-diver Ashleigh Baird plunging into Belize's Great Blue Hole, believed to be the largest marine hole of its kind on the planet. It's pretty astonishing, from the descent itself to the stingrays she finds deeper down. More videos are going to be released sequentially on Snapchat and Twitter to demonstrate the capability of the SeaSeekers. The hope is that eventually the gear will be made commercially available if Snap can get the patent secured. Initially at least, they'll only be accessible to Royal Caribbean cruise-goers, but if that goes well then they might get a wider release. Knowing, they'll probably end up distributing them using a fleet of yellow submarines or something.